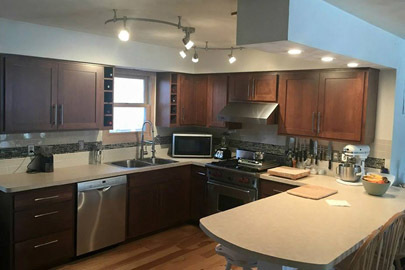 Kitchen Remodeling Peoria, IL | Kelley Construction Contractors, Inc.
Our experienced team can help with a professional design and construction services to help you pull off your kitchen renovation. Kitchen remodeling means changing the heart of your property. Let us give your kitchen new life with a high-quality update. We understand the latest kitchen design trends, and our team can work with you, providing recommendations and renderings to make sure you get the perfect kitchen for your needs. The quality materials and expert attention to detail provided by Kelley Construction Contractors, Inc. will reward you with a kitchen as fabulous as it is functional. What types of kitchen renovations can you do? Don’t see something on the list that you are considering renovating in your current kitchen? We would love to hear about it. Contact us with your ideas and we will do everything we can to make them happen. What’s the process for an entire kitchen remodel? While all of our kitchen remodels are customized to meet your needs, space, and budget, we have developed a process to make sure the whole thing goes as quickly and smoothly as possible. Design: Deciding between laminate and hardwood or unsure of the best countertop material? Our team works with a wide variety of products and materials, and can craft a beautiful design that fits your budget. All design and rendering fees are reimbursed at the final price of the kitchen’s installation. Demolition: Clear the area unless you have a hard hat because after design comes demolition. That will allow us a clean slate and workspace for us to begin the actual construction work. Cabinetry: Once the old kitchen is cleared away, new cabinetry is installed. We work with Shaw Cabinetry, as well as custom-built designs in-house, to provide ample storage space for your new kitchen. Countertops: After the cabinetry is complete, we can install new countertops so you have plenty of workspace. We can customize any material, size, and shape, all depending on what you like. Flooring: So the new cabinets and countertops are ready, and now it’s time to install your new flooring. After this point, it’s just a few minor details before you can enjoy your new kitchen. Fixtures: Sometimes the finishing touches make the most difference. Our team will install any new lighting fixtures or other final touches you want to make your kitchen your own. Depending on the project, we estimate that this process takes about 1-3 weeks. To get started on your kitchen remodel or to talk with one of our designers, contact us today!